Rohit has been the Trade & Investment Commissioner for India, for the New South Wales Government since October 2009. He is responsible for attracting foreign direct investment, trade and other business and directing promotional activities for New South Wales (NSW). Rohit has worked both in government and the private sector over the last nineteen years and prior to his current role, Rohit was Chief Representative in India for the Mayor of London’s Office and the London Development Agency (LDA). Rohit worked for the Australian Trade Commission (Austrade) in Mumbai from 2002-2007 and was awarded the ‘Global Austrader Award’ in 2006. After starting his career in marketing roles with Jindal South West (JSW), a leading Indian steel company, Rohit joined Expopoint Software, specialising in software and direct marketing activities for business events. 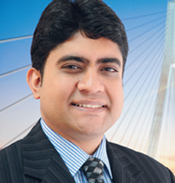 Rohit established the Singapore office of Expopoint, leading the South-East Asian operations of the company through markets in India, Hong Kong, Malaysia and Singapore. He holds a Masters of Business Administration in Marketing.